The Miami Trace varsity basketball team, winners of the Ironton Shootout. (front, l-r); seniors Tori Evans, Becca Ratliff, Olivia Wolffe, Cassidy Lovett; (back, l-r); Gracee Stewart, Shaylee McDonald, Aubrey Schwartz, Aubrey Wood, Shania Villaruel and Magarah Bloom. The Miami Trace Lady Panthers have been busy this summer putting in the work in the gym and weight room, at several shootouts and the Cedarville basketball camp. 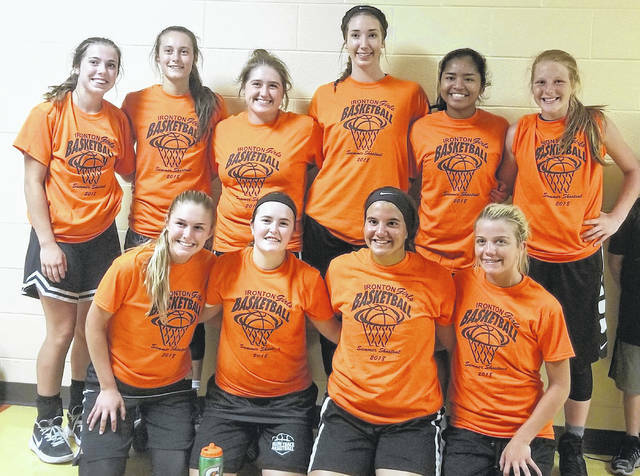 The girls started out the month of June with a couple of shootouts at Ohio Dominican, a Monday night league in Jackson, Cedarville basketball camp and the Ironton shootout. They will finish up in Fairland for a shootout later this week. They have been matching up against some of the top teams in the state to better themselves for later on this season, from the junior high girls to the varsity level. On Monday, June 18, the varsity girls were at the Ironton shootout. There were teams from Kentucky, West Virginia and Ohio. Included in those Ohio teams were also Frontier Athletic Conference teams Washington Court House and McClain. Ironton held a crunch time tourney, where the county rivals, Lady Panthers and the Lady Blue Lions, played it out in the championship game. The game went into sudden death after it was still tied after regulation play. The game went scoreless for several minutes, until Shaylee McDonald was fouled and scored the winning free throw. The Lady Panthers received their championship shirts for winning the crunch time tournament. https://www.recordherald.com/wp-content/uploads/sites/27/2018/06/web1_MT-girls-basketball-team-at-Ironton-shoot-out-June-2018.jpgThe Miami Trace varsity basketball team, winners of the Ironton Shootout. (front, l-r); seniors Tori Evans, Becca Ratliff, Olivia Wolffe, Cassidy Lovett; (back, l-r); Gracee Stewart, Shaylee McDonald, Aubrey Schwartz, Aubrey Wood, Shania Villaruel and Magarah Bloom.